Let go of what you already know how to do. Be willing to build new skills. Accept the process as your teacher. Recognize your blossoming, personal systems. Collect tools along the way. Master your techniques with practice. Understand that it’s not a quitter’s journey. 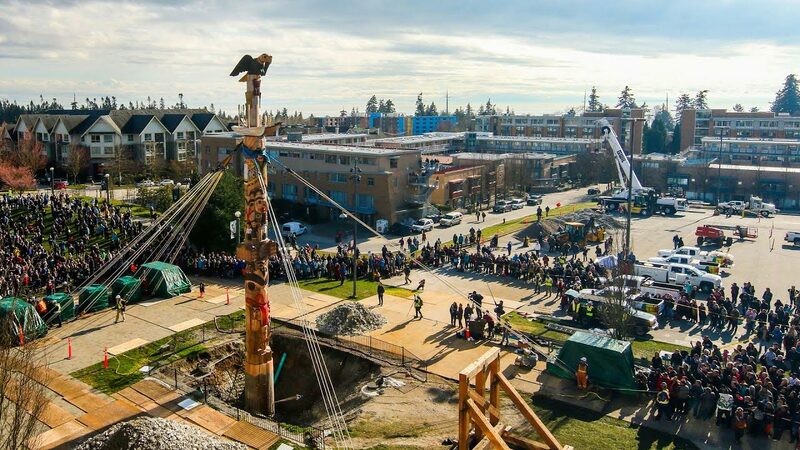 The Reconciliation Pole is raised facing the site of UBC’s Indian Residential School History and Dialogue Centre due to open in the 2017/2018 school year. 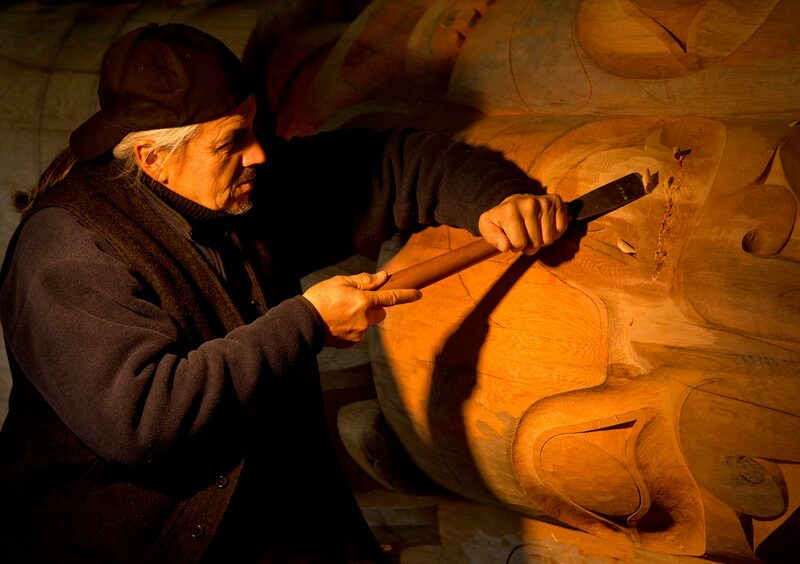 Esoterica: This past weekend, Haida master carver James Hart and his team’s 17-metre Reconciliation Pole was raised by traditional method on the campus of the University of British Columbia. Carved from the bole of an 800-year-old red cedar on the northern coast of British Columbia, the pole honours the victims and survivors of Canada’s residential school system which, beginning in the 19th Century, sought to erase the traditions, languages and culture of Canada’s First Nations people. The Reconciliation Pole is designed in three parts and tells the story of the time before, during and after the residential school system. It includes 60,000 copper nails, hammered into the pole by survivors, family members and schoolchildren, with each nail representing an indigenous child who died from abuse at school. 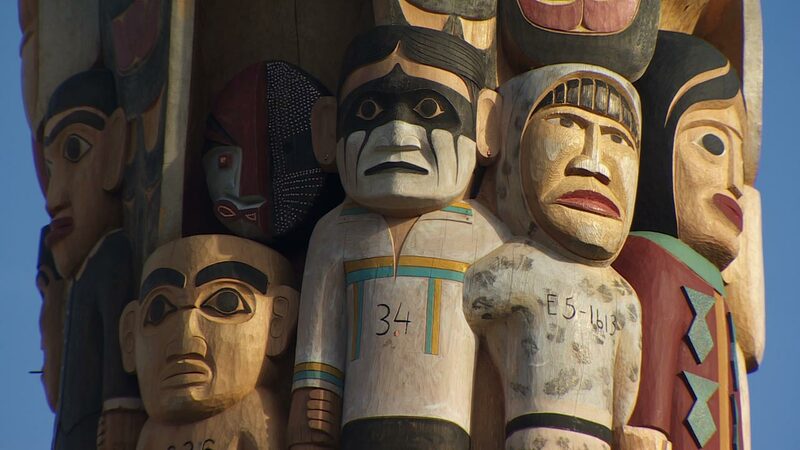 The pole’s carvings also include children wearing uniforms and numbers, a family, animals, a Shaman, the residential schoolhouse that Hart’s grandfather attended, a whale and Thunderbird, a canoe and longboat and an eagle, each symbolizing a part of the history. 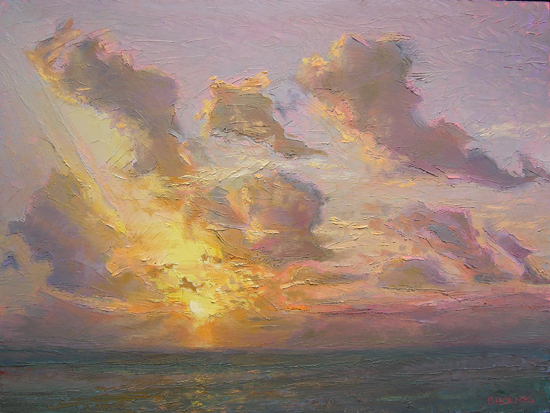 When reflecting on the two-year project, James Hart said that as he uncovered details it became increasingly difficult emotionally, but upon completion he felt grateful that the work invited education, discussion and a point of connection. “I’ve got to pay attention to this in a truthful manner;” he said. “The way our children were treated in residential schools was a horrific time for us. We are still getting over that. But we have a good grip on what has taken place, how it affected us and what we are doing to heal ourselves and move forward. The hope is we move together with Canada and have some say on what is going on in this country.” Canada’s last residential school was closed in 1996. 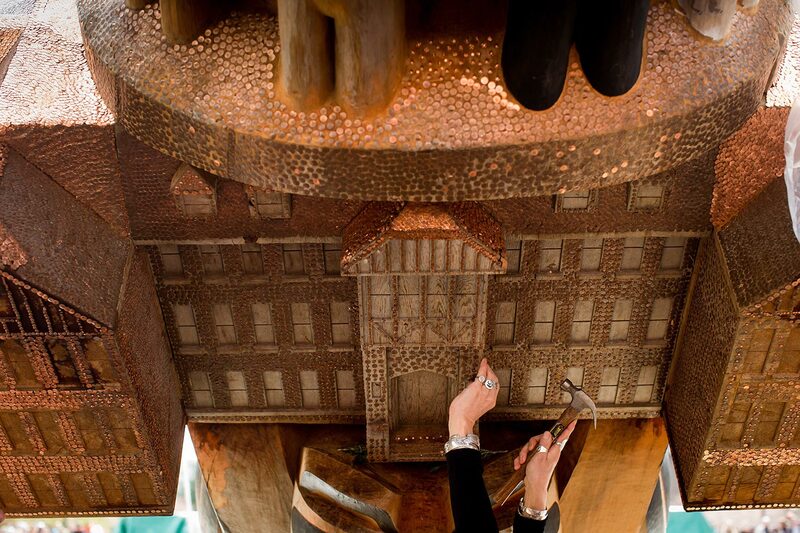 Copper nails are hammered into the schoolhouse. Thank you so much for this information. So sad, but powerfully important! Excellent and timely. Thank you! So perfect! Once again it reaches deep in my heart! Thank you, again and again, for your insightful posts. I listened to a CBC interview with James Hart leading up to the ceremony. I could feel the emotion of the day in his voice. Right up to just moments before they began moving the Reconciliation Pole into place , he continued to work on it with his tools….. and I couldn’t help but wonder how difficult it was for him to let it go out to the world ….. giving so much of his spirit and heart that has gone into this project …. Thank-you to all for your wonderful comments and insights. 60,000 is an overwhelming number. I am in awe of the indigenous spirit and their connection to the natural world. I admire their courage and their openness to reconciliation. I regret immensely the arrogance and superiority complexes that devised their demise. I am thankful they were not extinguished and for their willingness to build anew. Together we can create something beautiful. So often I am feeling like a lone eagle soaring, waiting for the passion and connection of creation to arise, to settle in mind and become. Your messages hit home. ALways i come away with hope, the feeling of art ‘family’ and purpose. Excellent letter, Sara. Please keep them coming. I, too, had to check if this was a past post, written by Robert, or penned by you, Sara. You definitely have your own voice, but his can be heard through you. That sounds like a contradiction, but you manage to make it possible. This was an excellent piece of writing. Thank you, Sara! Always a pleasure to reap the truth in your words and heartfelt descriptions. This writing sets all of us up to the responsibility of taking care of each other. one of your best, if not the best yet. Sara, your Esoterica piece was amazing. Thank-you so much. What a wonderful piece. I forwarded it to many many of my friends and they will forward it to theirs. Not much more to be said. What a tragedy, what shame, what sorrow. Like other catastrophes, it will not soon be forgotten nor will it ever be fully reconciled. But for us in Canada to be conscious is a start. I just heard back from a cousin in tiny town Wolseley, Saskatchewan and that is what she and her class are discussing right now. She was grateful for your input. Again, thank-you for raising consciousness. Forever grateful for these posts. Like others I thought at first I was reading your dad’s words. Thank you for continuing to share your insights and his. You are both such gifts to the world and help me understand what it means to be an artist. Thank you. I can’t imagine how challenging–and meaningful–it must have been to begin co-writing The Painter’s Keys with your dad, dear Sara. I’ve been reading here for over a decade, loving the deep connection with another artist’s mind. Your dad took up all topics–from sqeezing paints to art dealers to the insecurities we artist’s entertain in our daily work. That, and he was a profound writer and thinker. What a tall order to step into those family shoes. But you haven’t, not exactly. You’ve found (are ever finding) your own shoes. Case in point this letter on the quest as key to all artist’s seeking sustained creativity. Brava! aspects of exploring visual arts. Sharing the ground where huge feet have trod before and draws us onwards to find within us what is there to share and sharpen without barriers of age, location or stage of accomplishment. I know I will re-read this piece many times in the coming days as I work through a feeling of belonging and need of reassurance. That steady work equals steady improvement and each step a closer one to a new articulation. Bless you. So comforting to finally see some progress on the pain that was caused by residential schools. We are all accepting and moving forward to acknowledge and heal these wounds from the past. Your words are ringing so very true with me and my family right now. The word “quest” caught my eye and as I read about James and the Reconciliation Post, my family quest is is also looming to a close. For the past twelve years my cousin and I have been looking for the remains of my uncle, a pilot with the American Volunteer Group in Burma. In 1941 he was killed in a training accident, buried in a local cemetery, never to return home. But the truth of the time prevailed, and we recently discovered his remains were moved in 1948 and placed in an “Unknown Soldier” grave in Hawaii. A year ago his remains were disinterred for DNA identification. In Jan., 2017 he was positively identified! Now, we are planning his homecoming much to our tears of disbelief after a long quest. We have learned so many things along the way and met many wonderful people. Long lost family has been located because of the needed DNA, and now they are all coming to his funeral. John Dean Armstrong, AVG, Flying Tiger will be buried in Kansas in June. Thank you Sara for your reminders of the spirit of the quest…in art as in life, learning the truth of the past gives hope for the future. Please see Justice Murray Sinclair’s statements as head of the Truth and Reconciliation Committee.